This recipe requires a waffle iron of some sort - electric, cast iron, etc. - and goes great with homemade whipped cream. See the whipped cream recipe on this blog. 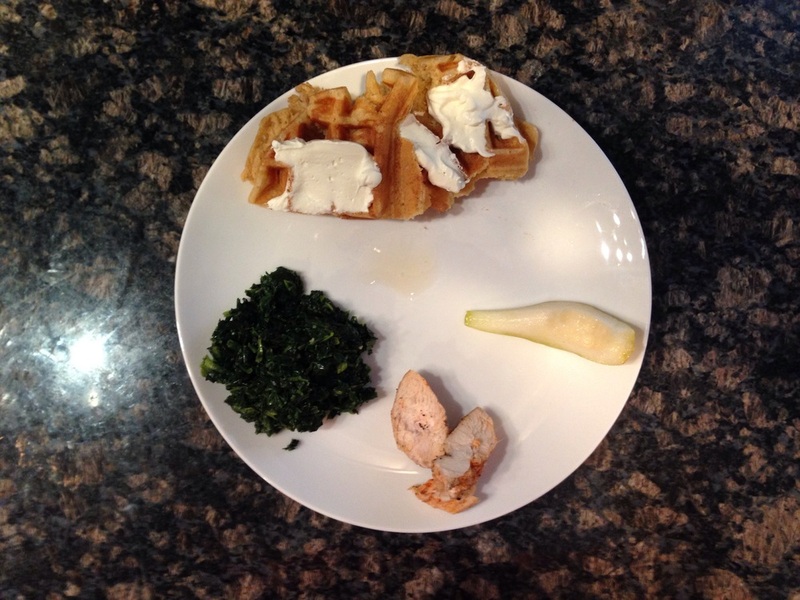 This healthy breakfast was served with steamed and sautéed spinach, Concord pears, and leftover pan-seared chicken. Note the portion sizes! 1. Heat waffle iron to medium heat. Waffle irons without a non-stick surface may require oil to be sprayed or brushed on before batter for each waffle is added. 2. In a medium bowl, beat eggs with whisk until smooth. Add remaining ingredients to bowl and mix with whisk until smooth. 3. Pour approximately 3/4 cup batter onto the waffle iron. Close lid and cook for 2-3 minutes or until steaming stops. Remove waffle and enjoy with whipped cream, berries, or Grade B maple syrup.